It's hard to believe that we said goodbye to the 2013 UK airshow season over six months ago, but finally the 2014 season is now upon us. 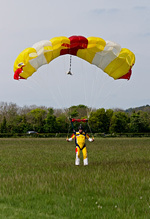 The Abingdon Air and Country Show once again had the honour of kick-starting the UK airshow season with its uniquely relaxed and laid back style. The confirmation of MidAir Squadron's eagerly-awaited Canberra PR9 in the flying display meant this was an Abingdon that was perhaps more anticipated than any in recent memory though, particularly given the Canberra's withdrawal from Duxford's final show of 2013 had meant such a lengthy wait for a mainstream display début. Was it worth the wait? Andy Evans kicks off UK Airshow Review's 2014 season with this report from a pleasantly warm Abingdon, with additional photography by the UKAR staff team. Over the past 15 years, the Abingdon Air and Country Show has grown from a small local event to the first significant public aviation event of the calendar, and where many performers make their annual display debuts, even attracting regular international participation (this year in the shape of a RNLAF PC-7). The enthusiast community attends from all over the country too, to reaffirm long distance friendships and to brush up on photography skills that have become rusty during the winter. With the promise of a debut from the MidAir Squadron with their duet of a Canberra PR9 and Hunter T7 together with a good-to-great long range weather forecast, the 2014 show saw a much stronger enthusiast attendance than usual with the front row of the display line being filled within half an hour of the gates opening; something that is unheard of to regulars at this show. The layout of the showground was similar to previous years, however it was notable that there were some fairly large gaps that had previously contained stands and displays that were unfortunately missing this year, which is sadly a sign of the times. Nevertheless, aircraft arrivals continued throughout the morning and were strategically parked so that the crowd were able to get the best view of them all. Soon the disappointing news broke that Peter Vacher's Hurricane I was unable to leave it's home airfield and that the Lynx AH7 display had sadly cancelled. 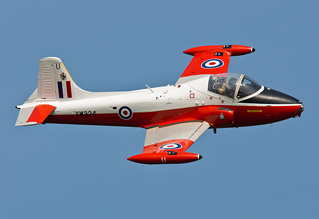 Adding to the woe was an announcement that the Midair Hunter T7 would not be available for its public display debut, despite having made it's first flight in a number of years just days prior. However the show must, and did, go on, with a varied line-up of acts boosted by substitute performers booked to cover these late cancellations. In a first for Abingdon, the show kicked off with a ground display in the form of a T-55 Tank. This was a bold move for an airshow and was a welcome departure which showed that the organisation team were looking at new ways to entertain the crowds. Unfortunately due to what appeared to be a communication breakdown, the display broke down into complete confusion. That said, the sight and sound of the tank letting off two blank rounds in front of the crowd made everyone's heart stop and really drew attention to the display line ready for the opening act of the 2014 airshow summer. It was the RAF who kicked the display off with a flypast from a C-130J, locally based at RAF Brize Norton, followed by the Battle of Britain Memorial Flight's Spitfire Mk IXe resplendent in its new D-Day colour scheme. Peter Teichman immediately exposed the sedate nature of the BBMF display though, as he followed up within minutes of MK356's departure in his own Spitfire PR XI, flying a masterclass in how to display an iconic warbird. Peter's Spitfire was itself a substitute, with his originally-scheduled P-40 yet to emerge from its programme of winter maintenance and enhancements. The now very familiar TRIG Team flew their pair of Pitts Specials in an entertaining display that was both fast-paced and dynamic, the aircraft rarely leaving the crowd line to reposition. In fact it was a display which was perfect for the size of airshow that Abingdon represents, and the TRIG Team are well on their way to becoming one of the UK's finest aerobatic duos. A number of other aircraft continued the RAF trainer display theme, including a Bulldog T1 and a pair of Jet Provosts, a T5 and a T3. 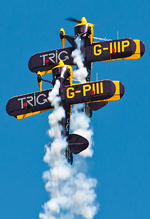 The 'JPs' both provided stunning displays, with multiple top side passes and some graceful sweeping turns and loops at crowd centre, although with a slight delay on the T3 meaning the pairs routine was dropped in favour of individual solos, having them back-to-back was not perhaps the ideal scenario, especially considering how closely the two Spitfires had been earlier in the programme. Rod Dean's display in the Bulldog T1 was another performance which always pleases the crowd, and any future RAF Tutor T1 solo display pilot would do well to replicate this high energy and photographically pleasing sequence. Competing with MidAir for the crown of best display at Abingdon was Peter Holloway's jaw dropping display of his Fieseler Storch. This STOL aircraft is famous for its ability to fly at speeds so slow that would result in almost any other aircraft falling out of the sky, however this exhibition showed just what (slow) speed it was really capable of. Virtually stopping in mid-air, what followed was a display of immense slow speed agility including sideways flight and a number of STOL landings/take-offs that would put even the Harrier to shame. The Storch was another of the last-minute additions that organiser Neil Porter called upon after late cancellations, with other additions to the display including Mark & David Miller's immaculate De Havilland DH-89 Dragon Rapide and John Beattie flying Kennet Aviation's T-6 Texan. One of the benefits of Abingdon for enthusiasts is that many of the static aircraft depart after - or some during - the flying displays. 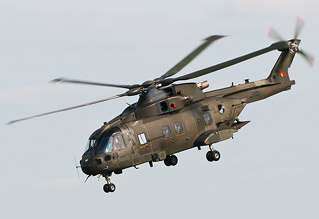 The RAF Merlin HC3 is always a popular static display at airshows across the country, and the crew performed an extremely spirited departure to entertain the crowd on what should be the aircraft's final year under Royal Air Force ownership, with transfer to the Royal Navy and upgrade to HC4 standard approaching. Another regular static participant at Abingdon, the OV-10B Bronco, departed after the display had finished, treating to those enjoying the evening sunshine to a pleasant flypast on departure. 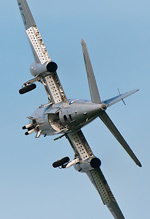 Without the Hunter, MidAir's reputation rested on the solo display of its Canberra PR9. Such was the quality of this routine, that's now a reputation that is growing enormously on the back of such rave reviews. Dave Piper's display in the Canberra included a number of topside and dirty passes which showed off the aircraft to full effect. Many have aired concerns about the new silver scheme on what was previously a hemp painted aircraft, however in the blue sky the aircraft looked superb - a real silver bullet. Although the display was flown higher and more sedately than the début at the Goodwood Revival last summer, the final pass at Abingdon will be remembered fondly by all who were present. Never before have we seen a classic jet bomber perform such a stunning high-speed pass and the resultant howl put any Hunter, and the Vulcan to shame. 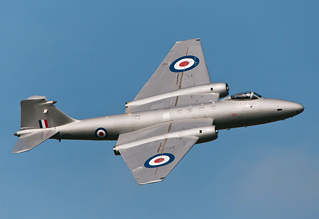 MidAir's Canberra is easily the new king of the classic jet scene. Whilst the show itself can be declared a resounding success, maintaining its reputation as the first must-attend airshow of the UK season, it wasn't without it's weak points. This year the most significant of these was easily the commentary, which was bordering on being unacceptable. The volume of the crowd line tannoy system for the commentary was set so high that it was deafening to any individual sitting within 50ft of a speaker, making viewing the airshow extremely uncomfortable experience. It was made even more uncomfortable by Abingdon's choice of lead commentator, George Bacon, who consistently continued to talk loudly, almost shouting down the microphone during displays to the point that the sound of the aircraft was drowned out on a number of occasions. People attend airshows to see and hear the aircraft, not listen to George Bacon. There were also a number of faux pas in George's commentary which began with him claiming to the crowd that the C-17, that was clearly in Brize Norton's circuit, was inbound to flypast and continued to him stating the C-130 flypast would be from a K model Hercules - one which was retired from RAF service last year! Some may see these as trivial, however they were silly mistakes to make for such an experienced commentator. George was then only to be surpassed by the commentator for the parachute display who can only be described as irritating, constantly laughing loudly down the microphone and not once stopping to take a breath during their entire display slot, which when combined with the climb to altitude in the Skyvan, occupied nearly 20 minutes. 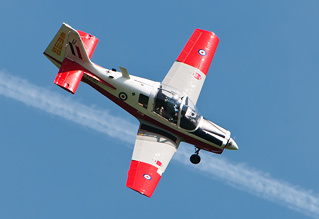 It's safe to say that Abingdon Air and Country Show 2014 was an excellent warm-up for the season ahead and thoroughly deserves its reputation. If the 2014 show is to remembered for something, it should be for the two master classes in how to display vintage aircraft properly that were put on by Messrs Piper and Teichman, something that the operators of a certain four engine delta wing bomber should take note of and perhaps even the BBMF. Even with it's weak points, the current format that the show uses is extremely successful and providing that it continues to receive the support it currently enjoys from the rest of the industry, then it will continue to grow from strength to strength for years to come.